Tim Tebow Goes Yard...Again, That's About It. Tim Tebow went yard for the second time in three games. It's officially crazy land in the minor leagues, because this shouldn't be happening. Timmy is only one home run behind the other circus act that came through the minors in the 90's. I'm speaking of MJ if you didn't pick up on that. Jordan had three home runs total in his time with the Double-A Birmingham. The one thing the two have in common? They know how to swing and miss the ball. 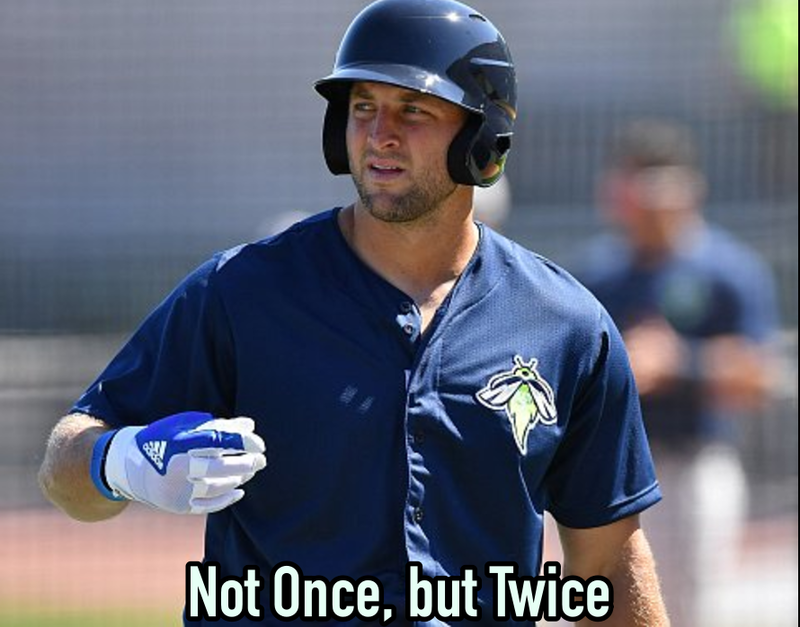 MJ swung and missed 117 times in his one season, Tebow is on pace to break that record as well. He struck out 5 times over the first 3 games he appeared in going a whopping 3-13 with 5 k's, 5 RBI's, and 2 Home Runs. What I am saying is, Tim Tebow is going to be the next Adam Dunn. Guy is all pop, minimal contact. If that's what works and gets him to move up in the ranks, who am I to criticize? Ok, I'll only criticize every few weeks now.